and amazingly the research by Dr Raymond Moody tells us that most people posses the innate ability to bring forth visions of the Afterlife when the conditions are correct. 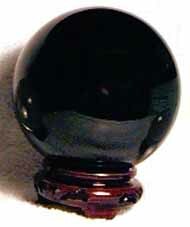 The principle behind scrying is rather simple and is not mysterious or supernatural in any way. Rather, when our brain has no stimulating input through our normal senses, our mind itself brings forth its own internal stimuli. Thus by fixing our gaze on an opaque featureless surface with no reflections (whether, crystal, water, oil or glass) there comes a point where our mind itself brings forth these images, sounds, smells, feelings etc. These projections from our mind may range all the way from fleeting glimpses of clouds to full 360 degree visions complete with all normal senses. Dr Raymond Moody discovered that most people can have reunions with departed loved ones when a number of simple steps are followed. These steps are followed throughout the course of a full day at Dr Moody’s Theater of the Mind in rural Alabama. The subject would take an extended walk in the countryside during which they explored, together with Dr Moody, the subject's motivation for seeking this experience. Then, after a light lunch, there would be an in-depth interview during which the details of the subject's relationship with the departed were brought to light and discussed fully. Mementos associated with the departed loved one which were brought by the subject would be displayed and the meaning of each discussed in depth. The subject would then be conducted into an apparition chamber that contained a large mirror inclined at an angle so that no reflections were visible in it. Under subdued lighting, the subject would be instructed to gaze deeply into the clear depth of the mirror. Afterwards, the subject would be conducted into separate interview and allowed to describe his or her experience in full detail and to ventilate emotionally. Amazingly over 50% of those undergoing the above mentioned procedure experienced vivid visionary encounters with departed loved lone. There were a number of highly surprising features of these results: Thus far, all subjects have taken the reunions to be real events and not as fantasies or daydreams. Approximately twenty- five percent of the subjects encountered some other departed loved one than the one they had prepared to see. Approximately twenty-five percent of the subjects experiencing apparitions reported some further encounter with the departed after they returned to their own homes. Almost every subject said in one way or another that the reunion had helped them resolve unfinished business with the deceased. Thus far, this procedure has been successfully replicated by at least ten other investigators working independently. We can now say that the common human experience of seeing apparitions of the departed can be precipitated in psychologically normal subjects under controlled circumstances. For more information on this fascinating phenomenon visit DrRaymond Moody’s Reunions page. Also further information on the “Psychomanteum” website. To read about science’s view on this subject click on the blue navigation button on the left.